With reference to the post below on the value of art, The Art Newspaper reports that the Los Angeles County Museum of Art is about to commission Jeff Koons to create a sculpture of a life size replica of a train that will dangle from a crane – commemorating the railroad’s part in 19th century America’s westward migration. 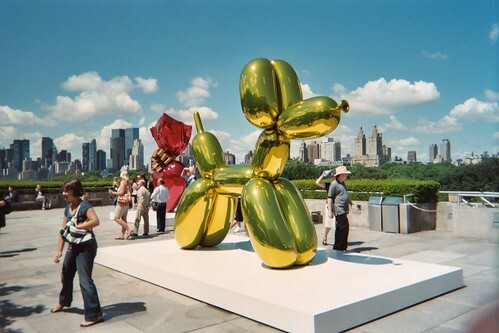 “We’re talking about a $25m work,” says Koons. Twenty-five million makes it the most expensive artwork ever commissioned by a museum – even more expensive than Richard Serra’s $20m commission for the Guggenheim, Bilbao. Talks between LACMA and Koons began two years go, in those long-gone days when it looked like the boom was going on for ever. In times like these, it seems absurd for an art institution to be shelling out this much for a single artwork. And you don’t even have to be of the Patti Smith opinion, that Koons’ work is “just litter upon the earth”, to think this kind of commission is a very bad idea right now. I was in Los Angeles a couple of months ago. The nature of the city means that the larger art institutions like LACMA and the struggling MOCA seem to have so little connnection to the real life of the city. In this climate, in that city, the Koons commission way looks too much like art as big shiny bling.